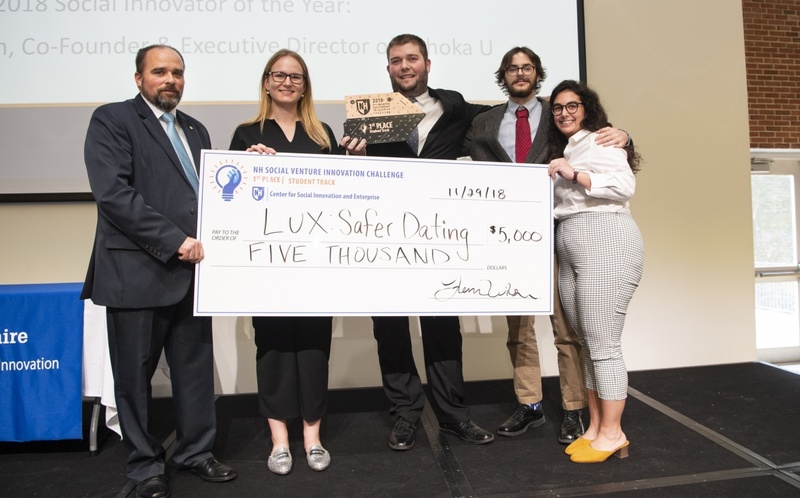 The winning student team in the Social Venture Innovation Challenge at UNH was LUX: Safer Dating. From left to right: Alan Brown, vice president, community relations & CRA manager, Kennebunk Savings; UNH mechanical engineering students Christin Badylak-Reals, Sean McLoud, Mark Torpey and Julie Berberian. DURHAM, N.H.—The winners of the University of New Hampshire’s sixth annual NH Social Venture Innovation Challenge were a team of four UNH engineering students who proposed an idea that integrates wearable technology and location tracking to mitigate dating sexual violence; and in the community track, a team that proposed an independent quick-deploy means of communications with emergency crews and family during natural disasters. Winners took home prizes of cash and services worth over $50,000. Designed to be a social innovation accelerator, participants develop original proposals for creative, financially sustainable solutions to some of society’s most pressing sustainability challenges. Entries this year included innovative solutions to issues spanning from ocean clean up and indoor farming with differently-abled employees, to addressing food insecurity in N.H. and reducing the cost and environmental impact of textbooks. “We know that effective solutions to society’s most insidious problems will increasingly need to come from collaboration—across private and public sectors, and across fields and disciplines—and this challenge not only encourages that type of innovation, but shows what it can accomplish,” said Fiona Wilson, executive director of the Center for Social Innovation and Enterprise at UNH. Major supporters of the SVIC include Impax Asset Management | Pax World Funds, Kennebunk Savings, Pierce Atwood, and Timberland. Additional supporters include, AMI Graphics, CCA Global Partners, Cirtronics, Cole Haan, Monadnock Paper Mills, New Hampshire Businesses for Social Responsibility, New Hampshire Business Review, New Hampshire Charitable Foundation, New Hampshire Clean Tech Council, New Hampshire Tech Alliance, Normandeau Associates, Pete & Gerry’s Organic Eggs, PixelMEDIA, Prime Buchholz, and ReVision Energy. Since its founding in 2013 in partnership with Nobel Prize laureate Muhammad Yunus, the SVIC has seen participation from more than 1,200 contestants and provided over $300,000 in funding and resources to winners. The program is a collaborative, interdisciplinary event, organized at UNH by the Center for Social Innovation & Enterprise, and co-hosted by the Carsey School of Public Policy, the Peter T. Paul College of Business & Economics, UNH Sustainability Institute, UNHInnovation, and Net Impact UNH. A full list of winners in each track is below and all of the 2018 finalists videos can be viewed here. Second prize: UNH Fish Feed NH, which utilizes aquaculture to support NH's food insecure. Team members included UNH alumna Eileen Liponis, ’95G and Jayson McCarter, Paul Morrison, Moriar Webster and Maddy Webster, all of Manchester. 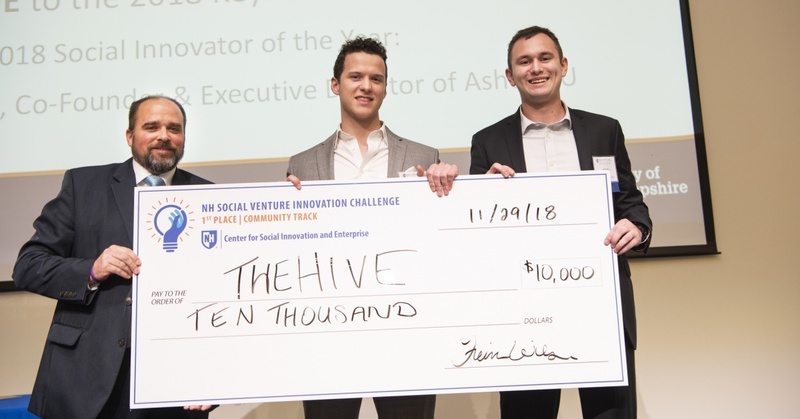 Caption: The winning community team in the Social Venture Innovation Challenge at UNH was TheHive. From left to right: Alan Brown, vice president, community relations & CRA manager, Kennebunk Savings; and UNH alumnus Devon Crawford ’18 and Jack Nichols, both of Milford. Caption: The winning student team in the Social Venture Innovation Challenge at UNH was LUX: Safer Dating. From left to right: Alan Brown, vice president, community relations & CRA manager, Kennebunk Savings; UNH mechanical engineering students Christin Badylak-Reals, Sean McLoud, Mark Torpey and Julie Berberian.